His dream of becoming a broadcast journalist was shattered at age nine when he became paralyzed. 38-year-old Seidu Alhassan now sleeps in front of people’s shops in Accra at the mercy of the weather just to survive. Plagued by thoughts of suicide, Seidu is struggling to keep hope alive even in his despair, choosing to believe that he could still achieve his dream. 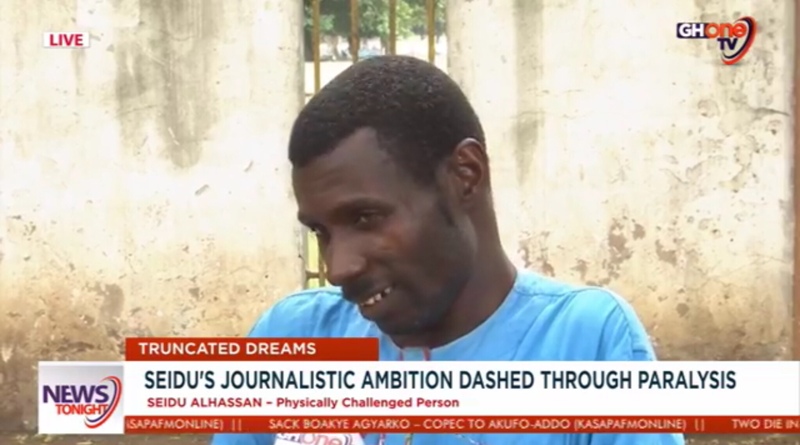 Seidu Alhassan is plagued with whispers of suicide licking at his brain daily due to his physical disability which he believes has shattered his big dreams for his personal advancement in life. He met with his misfortune one morning when he woke up at the age of nine. He told Odilia it all happened when he suddenly felt he had stepped on fire in his home in the northern part of Ghana. His legs started shrinking and he virtually stopped walking. Attempts by his parents to correct the disability proved futile. He had to drop out of school due to his circumstance but he always cried when his younger siblings were going to school, forcing his parents to keep him in school. But it wasn’t easy. After completing Senior High School, Seidu made his way down South to the capital Accra to pursue his journalistic ambition. But he laments, no one wants to employ an SHS graduate journalist who has no formal inky training and is also physically challenged. Seidu narrated he sleeps on the outskirt of Accra in front of people’s shops. But this is not deterring him from pursuing his ambition of becoming a member of the inky fraternity. He believes more needs to be done to assist persons with disabilities in the area of jobs. But until Seidu Alhassan gets help to further his education in a communication institution, his dream of becoming a journalist will not materialize.